Louise Bourgeois was born in Paris in 1911. She lived through a traumatic childhood with a dominant father who paid little attention to her and humiliated her mother through years of a relationship with a young Englishwoman in their own home. Her father ran a restoration workshop for carpets in which her mother also worked. Her mother, who worked on the carpets with threads, is connected to the motif of the spider, a recurring central theme in Bourgeoiss pictures and sculptures. According to Bourgeois, the spider symbolises the maternal, the protective. Louise Bourgeois initially studied mathematics at the Sorbonne in Paris before turning to fine art at various academies in Paris. She became a pupil of Fernand Léger, who encouraged her to work as a sculptor. In 1938, she emigrated with her husband, the art historian Robert Goldwater, to New York, where she lived until her death. Louise Bourgeoiss works find their roots in her own childhood, which was marked by her difficult relationship with her father and the benevolence of her mother. The installation The Destruction of the Father and countless works with the motif of the spider, such as, for example, the gigantic, metre-high spider figures, the Mamans, were born out of this. Bourgeois received numerous honours, awards and prizes, and The Museum of Modern Art in New York dedicated a retrospective to her. 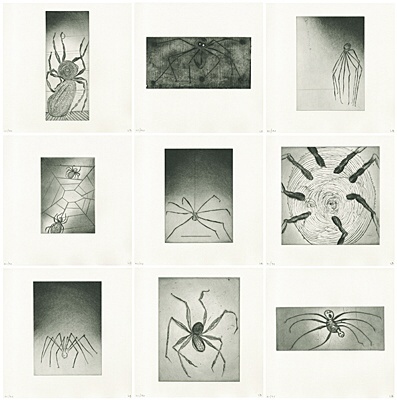 The work of Louise Bourgeois, who worked with unusual materials such as latex, wax, and cement, but also with wood, bronze and marble, comprises sculptures, numerous prints, installations and the spatial cell works, enclosed spaces often made of wire mesh. 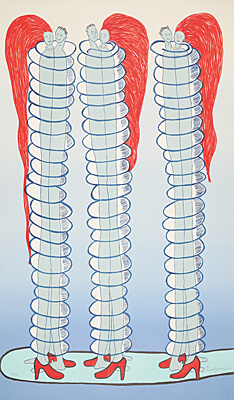 Louise Bourgeois is one of the most important women artists of our time. In 2010, she died in New York City at the age of ninety-eight.